Small businesses are selling like hotcakes. That’s according to new research from BizBuySell.com, which frequently surveys small business brokers, owners, and prospective buyers. According to the company’s most recent report (which includes the graphic used here), brokers negotiated a record 7,500 sales of small businesses in 2014 and another 7,200 transactions in 2015. They expect to see greater volume in 2016. “The small business for sale market is a hotbed of activity,” concludes the online business-for-sale marketplace where restaurants, liquor stores, hotels, beauty salons, bars, and gas stations are among the offerings. To be sure, while so many small businesses are changing hands, new businesses creation is lagging. We reported recently here on an Economic Innovation Group study that indicates the rate of establishment of new enterprises since 2008 is far behind the last two U.S. economic recovery periods. A lack of patience or desire to build a business from scratch could be one reason. BizBuySell research finds that “prospective buyers are looking to make a move quickly, with 45 percent planning to purchase a small business in less than a year.” Buyers surveyed expressed greater interest in owning established or independently owned businesses than new or existing franchises. Lack of resources to fund a startup might also drive entrepreneurs to buy rather than build. BizBuySell found that 28 percent of buyers are shopping for businesses priced under $100,000. More than half are shopping in the $100,000 - $499,999 range, and 19 percent are looking to spend more than $500,000 on an existing small business. 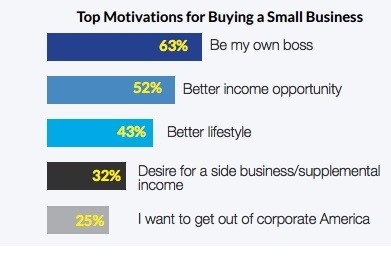 What motivates most of these buyers? Being boss, or, perhaps more accurately, not having a boss. In 2016, 63 percent of buyers, up from 50 percent in 2014, cited their desire to be in charge. But buying a small business as a side project or source of supplemental income is also on the rise—up from 22 percent in 2014 to 32 percent in 2016. BizBuySell.com’s full report The Demographics of U.S. Small Business Buyers & Sellers is available online.